The Medalist is our premium, dual carbon-laminated, full honeycomb core racing shell. It features Nike Omada shoes, press-molded carbon seats, and bow- or stern-mounted hard-coated aluminum wing or outriggers. Available in four sizes. ... in Epoxid, Aluminium riggers, bowball, bow number holder, aluminium fin, aluminium track, length 82cm, ball-bearing seats, rowing shoes Colour: white with 3 stripes on bow-deck, other colours on demand. An entry-level scull constructed with the durability of an interwoven carbon and innegra material. There will be podium finishes for your entire club in the competitive Fluid Fleet. 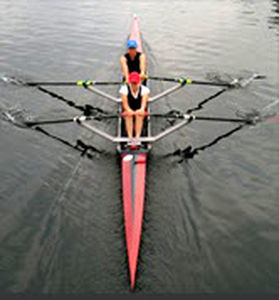 A double scull is a rowed vessel propelled by two people seated one behind the other, each working a pair of oars. This type of craft is used by both experienced competitors and recreational rowers. Racing models are narrow and streamlined for optimum hydrodynamics. They are very light, are generally made of carbon and are known for their instability. In contrast, recreational versions are wider, heavier and more stable. The latter are made of wood or of laminated polyester fiberglass. By definition, a scull, or shell has seats which slide on tracks. The rower's legs are braced against a footrest, transferring some of the effort to the legs and the rest of the body so that the torso and arms do not do all the work. Choice will depend on whether the scull will be used for recreation or competition, as each activity requires a different type of craft.